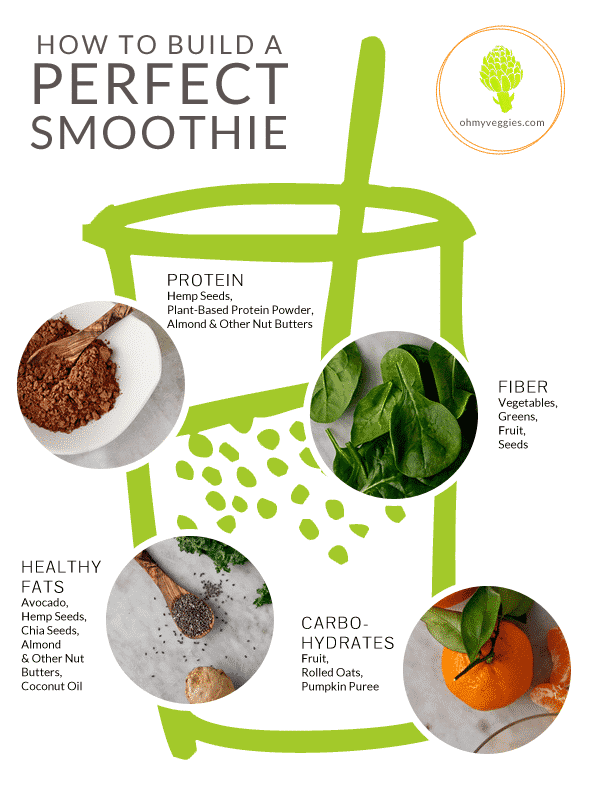 How to Build a Perfect Smoothie - Oh My Veggies! Hi there everyone and Happy New Year! My name is McKel–some of you may know me from Nutrition Stripped, my plant-based, gluten-free food and nutrition blog. I’m a Registered Dietitian, Health & Wellness Coach and food blogger who absolutely loves green smoothies; in fact I drink my Stripped Green Smoothie daily without fail! Today I’m going to share some of my personal tips and tricks on how to build a perfect green smoothie–either as a snack or as a meal. They’re packed full of vitamins, minerals, fiber, antioxidants, polyphenols, fiber, water, and oh did I mention fiber? They’re perfect first thing in the morning before your usual breakfast, as a snack, OR increase the serving to take place of your breakfast (up to 32 ounces or until you’re satisfied!). Green smoothies are quick and easy. If you’re someone who is always on the go, this is a great way to ensure you’re getting a substantial amount of greens into your diet (which are oh so important!). If you’re someone who doesn’t enjoy eating green leafy vegetables, this is a perfect way to sneak them into your diet. Not to mention, green smoothies are VERY kid friendly! Green smoothies are versatile. You can always add or remove ingredients to your liking. That’s why they are so easy to incorporate into your lifestyle. And of course, they’re DELICIOUS! Greens and Other Veggies – the king green kale, spinach, romaine, celery, swiss chard, mustard greens, dandelion greens, cucumber, wheatgrass, herbs such as mint, cilantro, parsley, and basil, etc. Fruit – bananas, apples, green apples, pears, kiwi, pineapple, peaches, mango, raspberries, strawberries, blueberries, papaya, lemons, limes, grapefruit, orange, blood orange, figs, dates, plums, acai, etc. Proteins – plant-based protein powders (brown rice, pea, Sunwarrior, Vega, etc. ), hemp seeds, chia seeds, nut butters, etc. Superfoods (Optional) – bee pollen, maca powder, lucuma, cocoa nibs, spirulina, chlorella, cinnamon, cayenne, young coconut meat, unsweetened shredded coconut, coconut water, avocado, chia seeds, hemp seeds, matcha tea powder, nut milks, sprouted buckwheat groats, raw gluten free oats, etc. 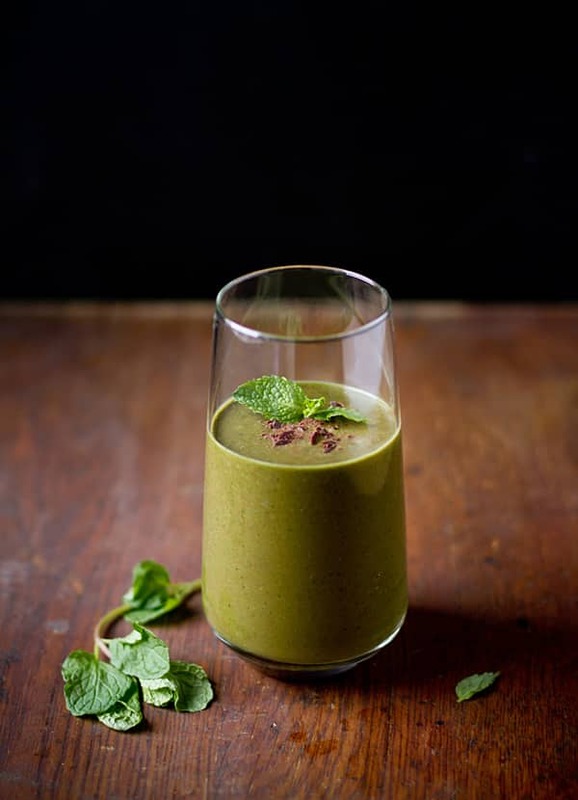 You’ll find lots of healthy green smoothie recipes on my blog and today I’m going to share one of my favorites–a Chocolate Mint Green Smoothie. 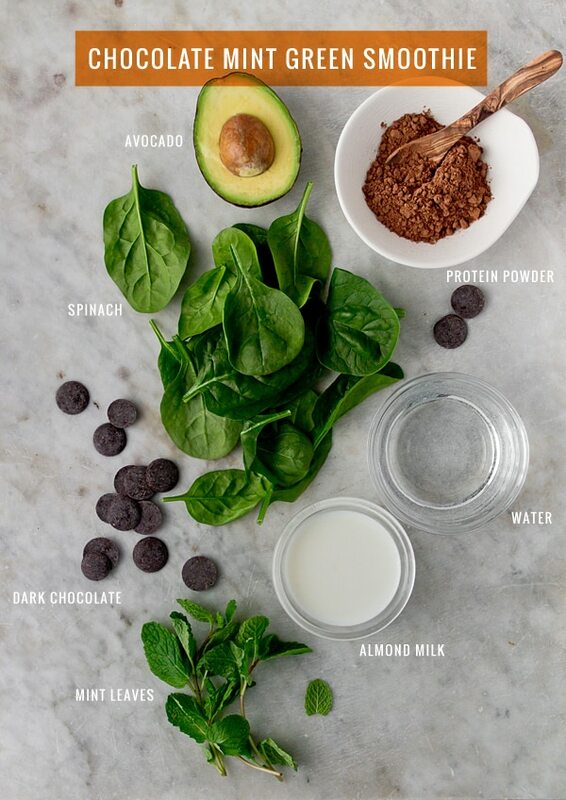 With healthy fats from avocado, protein powder, and spinach leaves, this smoothie definitely makes a filling meal! 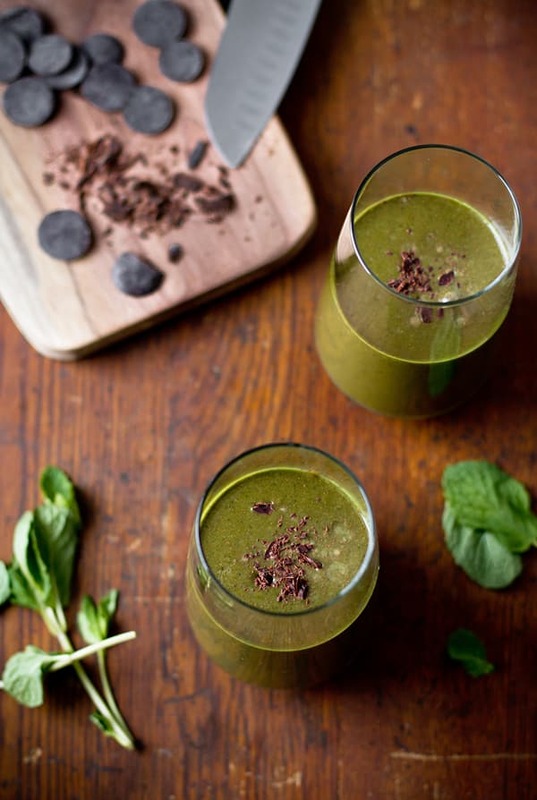 A meal-worthy green smoothie that tastes like a dessert! Add all of the ingredients to a high-speed blender and blend until thick and smooth. McKel is a Registered Dietitian/Health & Wellness Coach and the blogger behind Nutrition Stripped. A self-proclaimed green smoothie connoisseur, foodie, and nutrition science nerd, she has an affinity for plants and avocados. i love a morning smoothie as well..but havent tried this combination yet. thanks for sharing. You’re very welcome Dixya, I hope you enjoy it! Hey Julia! Yes, you’re correct- they can be intimating at first or down right unappetizing, but this one is such a great green smoothie to start out with! It’s like ice cream…only healthy 😉 Enjoy! This smoothie is stunning! I love the addition of the avocado. Sounds fantastic. Wonderful, I hope you enjoy it. The avocado is so creamy in it! This looks fantastic! Love that it’s fruit-free (except the avocado) as I’m avoiding sweet fruits at the moment. Perfect timing! Avocados are great to use instead of bananas if you’re watching your sugar/carbohydrate intake. Best to you! I just love this blog! Not only the content which is very inspiring, also the aesthetics! Oh, and with this smoothie I don’t have any cravings for bad food! Whoohoo! Love this post, and your blog McKel! Gorgeous photos. Glad to see you on OMV! I definitely need this smoothie tutorial! And I’m super enamored with that green. Plus chocolate and mint are SO my thing! I’ve been drinking green smoothies for breakfast for about two years now and recently also branched out into orange and red smoothies (with sweet potato! and beets!). I put together a little booklet of original recipes with my own photography in my Etsy shop: http://www.etsy.com/shop/Pidoodle. All of the recipes are gluten free, dairy free, mostly vegan, mostly raw, no processed sugars and no ice. This chocolate mint one looks delicious! I’m not crazy about protein powders–do you have any suggested substitutes? No biggie, if you’re not a fan of protein powders simply use any other of the proteins in that category such as nuts, seeds, spirulina, etc. Enjoy! I absolutely love all of the graphics in this post — beautiful! I too love green juices and smoothies, and I think I need to try this recipe out! Oh I love Rikki’s pictures. And this shake is on my list to do. Do you know of any recipes good for someone with Lyme Disease ? I sure do! I actually have one-on-one nutrition coaching services where I’d be more than happy to answer some of your questions specifically and design a meal plan for you. Email me at [email protected]. The one thing that I never put in my smoothie is a nut butter. I really need to start doing this! Samantha, you won’t regret it! It’s super filling and delicious to try out 😉 Hope you love it! I have a tahini smoothie on my blog Nutrition Stripped that would be awesome to try out too. What a perfect excuse to have chocolate for breakfast! This looks so incredible. Loved this post; so informative and gave me so many new smoothie ideas. Haha you figured me out Kara! That’s what I’m always trying to do- sneak in more chocolate 😉 I have another post called Green Smoothies 101 on my blog where I share more health benefits. I must admit I’m a tad addicted to smoothies of late, this one sounds fab! Love the addition of avocado – something I’m still getting used to using in sweets. I hope you enjoy this one- it’s a great way to “ease” into green smoothies! I made this one today. Not bad at all. The chocolate flavour greatly varies based off what brand of chocolate protein powder. Mine was pretty weak. Next time I’ll try adding half dark chocolate almond milk and half regular unsweetened. Creative idea and wonderful photos. Could coconut oil be used in place of the avocado? I’m out of avocado but want to try this recipe! This is great. Tastes healthy but only in the best possible way. I used 1 small avacodo, 3 cups spinach, 1c unsweetened almond milk and about 3/4c dark chocolate almond milk, Orgain chocolate protein powder (plant), 1tbs cacao nibs, and a few ice cubes. I put in 1 drop of mint extract but couldn’t really taste it and don’t think it was necessary for good taste anyway. No Stevia needed and didn’t add water. Thanks for the idea! Wow! I’ve never succeeded in making a chocolate peppermint green drink until now. Using what I had, this was awesome! I didn’t think I had any avocado so I left it out at first. It was more of a green drink instead of smoothie. I found less than a half avocado in the fridge and added that with a little coconut oil and coconut butter to make up for the tiny avacado. It was good but I think I preferred the less smooth version. I love getting all that good fat though. Oh, and I used Wicked Dark (95%) chocolate by Taza, romaine lettuce, and coconut milk. So all of my ingredients were slightly different but the amounts were the same. Thank you so much for the inspiration! I think even my 77 yo mother will drink this!